A ruderal species is a plant species that is first to colonize disturbed lands. The disturbance may be natural – for example, wildfires or avalanches – or a consequence of human activity, such as construction (of roads, of buildings, mining, etc.) or agriculture (abandoned fields, irrigation, etc.). The word ruderal comes from the Latin rudus rubble. Ruderal species typically dominate the disturbed area for a few years, gradually losing the competition to other native species. However, in extreme disturbance circumstances, such as when the natural topsoil is covered with a foreign substance, a single-species ruderal community may become permanently established, as depicted in the image on the right. 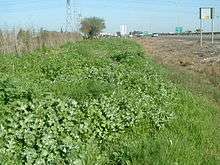 In addition, some ruderal invasive species may have such a competitive advantage over the native species that they, too, may permanently prevent a disturbed area from returning to its original state despite natural topsoil. Seedlings whose nutritional requirements are modest. Ecologists have proposed various scales for quantifying ruderality, which can be defined as the "ability to thrive where there is disturbance through partial or total destruction of plant biomass" (Grime, Hodgson & Hunt, 1988). The ruderality scale of Grime presents values that are readily available, and it takes into account disturbance factors as well as other indicators such as the annual or perennial character of the plants. A mixed-species ruderal community on the side of Israel's road 40, north of the Yarkon River, where topsoil was left after the road-building activity. ↑ Hill, M.O. ; Roy, D.B. ; Thompson, K. (2002). "Hemeroby, urbanity and ruderality: bioindicators of disturbance and human impact". Journal of Applied Ecology. 39 (5): 708–720. doi:10.1046/j.1365-2664.2002.00746.x. Chapin. FS. III. 1980. The mineral nutrition of wild plants. Annu. Rev. Ecol. Syst., 11:233-260.